May 8, 1937 - September 19, 2016 OKLAHOMA CITY After celebrating over 50 years of joyful service to God, Reverend Lowell L. Stieferman died on September 19, 2016. Father Stieferman was born on May 8, 1937 in Perry, Oklahoma to Leo and Pauline (Beier) Stieferman. He attended elementary school at Saint Joseph Catholic School, Perry, before entering high school at Saint Francis de Sales Seminary, Bethany. After three years, Father Stieferman entered Saint John the Baptist Home Mission Seminary in Little Rock, Arkansas. He was ordained to the priesthood at the Cathedral of Our Lady of Perpetual Help, Oklahoma City on May 25, 1963. Father Stieferman's first assignment was as associate pastor of Saint Joseph Old Cathedral, Oklahoma City. He also served as associate pastor of Saints Peter and Paul Church, Tulsa and as Administrator of Saint Jude Church, Tulsa. 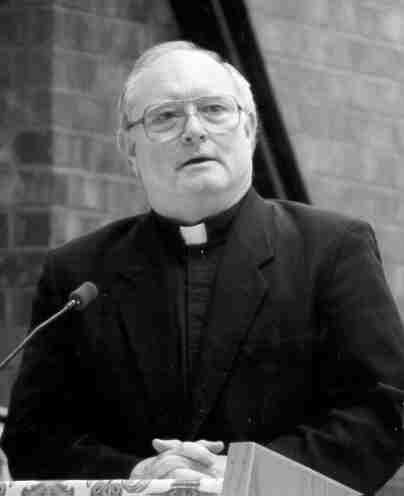 Father Stieferman served as pastor at Saint Peter Church, Woodward and missions in Mooreland and Shattuck; Saint John the Baptist, Edmond; Saint Francis Xavier Church, Enid; Corpus Christi Church, Oklahoma City; Saint Francis of Assisi Church, Newkirk; Church of the Epiphany of the Lord, Oklahoma City, and Saint Paul the Apostle Church, Del City. Father Stieferman retired from active ministry in 2010. In addition to parish ministry, Father Stieferman served as Director of the Permanent Diaconate Program, Chairman of the Archdiocesan Personnel Board, Director of Vocations, Regional Vicar (several regions), and Defender of the Bond for the Archdiocesan Tribunal. He also served on the Pre-Cana Team (for over thirty years), the Seminary Board, the Board of Evangelization, the Priest Ministry Team, and as a Priest Delegate to the Black Catholic Congress. Father Stieferman is preceded in death by his brother, Robert Stieferman, his sister, Carol Ann Warminski and nephew, Kevin Warminski. He is survived by his sister Mary Jane Gore of Tulsa, nieces, Donna Roche, Ponca City, Christy Bieker, Austin, and Alisa Carranza, Houston, and nephew, Robert Stieferman, Jr., Tulsa and many grand-nieces and nephews. Even with all the ways he contributed to the Archdiocese, he always remained humble, likening himself to Ananias, one of his favorite Biblical characters. He used the story of Ananias to remind those who knew him that each of us has a part to play in the great Body of Christ. Father Stieferman was a kind and gentle pastor and friend to all he met. A Vigil Service was held at 6:30 PM on Friday evening, September 23, 2016 in the Saint Francis de Sales Chapel at the Catholic Pastoral Center, 7501 Northwest Expressway, Oklahoma City. A Mass of Christian Burial was celebrated at the Church of the Epiphany of the Lord, 7336 West Britton Road, Oklahoma City on Saturday, September 24, 2016 at 10:00 AM. Interment was at Saint Rose of Lima Cemetery, Highway 77S and 15th Street, Perry, Oklahoma (Exit 185). Memorial donations may be made to the Stieferman Seminarian Burse, c/o the Archdiocesan Business Office, P.O. Box 32180, Oklahoma City, OK 73123.